over two-thirds consistency was obtained, which justified the use of the test further analysis. The high consistency of MAST CLA and SPT suggests that in the investigated group of children IgE specific for nuts, grain, carrot, and soybean prevailed. 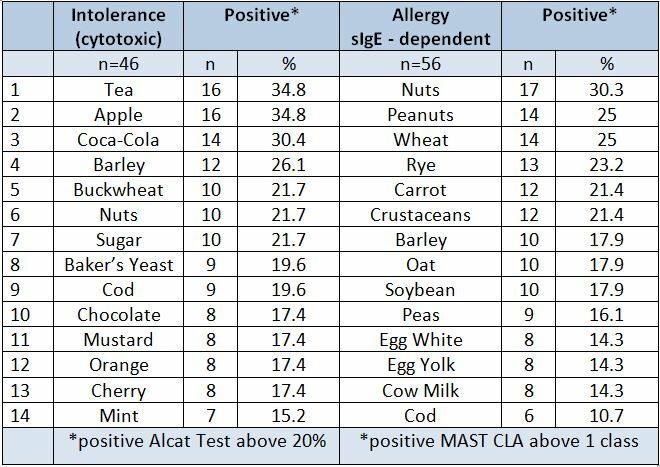 Comparison of these data to the Alcat cytotoxic test gives a different view of products customarily given to allergic children. Tea, apple, Coca-Cola, and barley proved to be the most frequent cause of food intolerance in children investigated with the Alcat Test. The occurrence of “atopic diathesis” is an expression of the defect of T cells, which control the response to environmental antigens [1,3]. Although many new diagnostic methods have been developed in recent years, diagnosis of food allergy is still difficult because its mechanisms have not been completely elucidated . It is known that only some part of its symptoms is accounted for by IgE dependent reaction. The contemporary allergologist, armed with a wide range of skin tests and even multiallergenic kits (MAST CLA) for the simultaneous determination of specific IgE or IgG antibodies, is faced by still cases which are difficult to diagnose . According to Fell  at least half of the clinical symptoms of “sensitivity” are due to IgE independent intolerance reactions. In such cases, so called cellular tests (CAST, ELISA, ALCAT, etc.) may be particularly useful [5,14]. The cytotoxic test, Alcat, is based on the measurement of changes in the number and volume of white blood cells following their incubation with adequately prepared allergens [6,10]. The application of kits for simultaneous evaluation of the standard amount of antigens allows more dependent immediate ones in children . The preliminary methodological aim of the study was to verify the value of the Alcat Test among children. The main purpose was to establish the prevalence and intensity of allergic cytotoxic reactions to IgE-dependent immediate ones in children. examinations, and in some cases, on the results of skin tests and determination of total IgE concentration. The investigation was performed according to the principles recommended by other authors [4,12,13]. The chemiluminescence method was applied using a multiallergen panel MAXITOP of the DHS CLA system (Bayer, Sverige). 1.2 ML aliquot of the patient’s blood serum was sufficient for all determinations. Luminescence was registered on Polaroid 57 film, and then read with DHSCLA reader (MAST immunosystems Inc. USA), SMJB_220 model. The kit recommended by  and  was used for the investigation. Each time, the measurements were automatically calibrated with the patient’s own positive and negative control sample. The results were written in CLA MAST scores: 4,3,2,1,1/10 and 0. There were a total of 784 determinations 453 performed. Specific IgE antibodies were determined for the following 14 food allergens: oat, barley, rye, wheat, cod, crustaceans, and molluscs, cow’s milk, egg yolk, egg white, peanuts, carrot, soybean, peas. B. The investigation with the ALCAT cytotoxic test was performed according to Fell protocol  on 46 children (20 girls, 26 boys), mean age 9.4 years who could be fully diagnosed with allergological methods. Methodological analysis was performed on 13 children (10 girls, 3 boys), aged 3-16 years, with complete documentation of a single blind trial with respect to open an elimination-exposition diet (OEED). The diet which was given to the children contained 8 kinds of food determined by the physician as “the most deleterious” regardless of the latent fact that by Alcat Test it had 3 positive substances (+) with more than 20% reactions, two uncertain ones (+/-) 16-9%, and 3 harmless (-) 0-5%. In total, 104 test diets were used. After decoding the Alcat Test results the following consistency with OEED was found: +/+=50, -/- =18, + -/+ -=4, in a total 72 cases, i.e. 69.23% of all tests. ALCAT / OEED inconsistency was found as follows: +/-=13, +/+ -=2, – /+=9, -/+ -=2, + -/-=6 in a total 32 cases, i.e. 30.77%. After comparison of the Alcat cytotoxic test results with the provocative diet results using single blind trail, more than two-thirds of consistency was obtained, which justified the use of the test for further analysis. For the elaboration of the assumed hypothesis, in 15 patients 30 sets of food were evaluated (450 determinations) and in an other 31 patients – 50 sets of food (1550 determinations). Thus, 2000 cytotoxic reactions were evaluated in total. It should be stresses that the antigen substrates used for both tests were supplied by the same producer – Dome/Hollister-Stier (USA). Comparison of allergenic extracts inducing cytotoxic reactions (measured with the Alcat Test), and their counterparts, inducing chemiluminescence after specific IgE binding in the MAST test, disclosed the following relationships: of the 14 investigated foods three induced strong and frequent undesirable reactions – intolerance as well as allergy. They included barley, nuts and cod. This indicates a possibility of simultaneous allergic and toxic actions of the same products, which is not always appreciated in practice. Strangely enough, food commonly recognized as allergenic, such as fish and nuts, also has cytotoxic actions. However, such a double correlation was not observed too frequently in individual patients. Instead, as a rule, the clinical harm was confirmed in provocative tests, regardless of the disclosed pathogenic mechanism. Frequently, only the Alcat test-oriented diet gave an improvement, which was not obtained in a significant degree with the use of a s-IgE panel. The sensitizing food ranking, presented in Table 1, is not consistent with literature data. In our 56 patients, egg white and milk allergy was found only in 8 cases (14.3%). Table 1. Presentation of food most frequently inducing abnormal reactions in vitro in the investigated children. Due to the unexpected inconsistency of this finding with the fixed views on the frequency of milk and egg allergy [7,9,13], we verified the results of the MAST CLA test with skin prick tests (SPT) in a group of 40 older children. We obtained 92% and 88% consistency of MAST CLA/SPT for milk and egg white, respectively. A similar high correlation between MAST CLA and SPT was also observed by other authors [5,8,11]. Discrepancies between the frequency of milk and egg white allergy in our patients and those reported in literature are possibly due to the higher mean age of the investigated children and to the fact, in most cases, the children had been previously treated with an elimination diet not containing these products. In 12 (21%) patients, specific IgE antibodies to carrot were found. Carrot, like soybean , is introduced early into an infant’s menu and may be the cause of food allergy. Comparison of these data with the Alcat cytotoxic test enables to have different look at the products customarily given to allergic children. Approximately one third of the cells with adequately prepared tea, apple, or Coca-Cola extracts. Approximately one forth of them reacted similarly to barley, and more than one fifth – to nuts and sugar. Other unexpected products inducing allergy include baker’s yeast, mustard, cherries and mint, whereas the presence of fish, chocolate and oranges on the list is not surprising. For a qualitative evaluation of the determinations, the magnitudes of individual reactions were established and compared. In the cytotoxic test, they were described as a percentage change in the magnitude and number of white blood cells in comparison with the pre-incubation sample, while in specific IgE reactions in the MAST classes were analogous to the RAST classes. The strongest cytotoxic reactions were proved to occur after apples (14-47%, mean 31.4%), sugar (mean 25.4%), tea – 22.8%, Coca-Cola (22.5%) and mint (19.8%) intake. No class IV was found. Predominant IgE reactions in class III concerned hazelnuts, peanuts, and carrot. In class II hazelnuts (7/56 samples), hens egg yolks and crustaceans (6/56 samples each), rye and soybean (5/56 samples each) were predominant. Porownano wyniki testu Alcat oraz slepej proby prowokcji dieta stwierdzono zgodnosc wynikow w ponad 2/3 przypadkow. Wykazano jednoczesnie wysoka zgodnosc dodatnich wynikow testow skornych z wybranymi alergenami pokarmowymi z wynikami uzyskanymi w tescie MAST CLA. Porownanie obu metod badawczych wykazalo roznice, ktore wynikaja z roznych mechanizmow patogenetycnych ocenianych tymi technikami. Testem Alcat potwierdzono czestsza nietolerancje m. in. herbaty, jablek oraz coca-coli. Author’s address: Prof. Krzysztof Buczylko, Centre of Allergology, ul. J. Tuwima 22/26, 90-002 Lodz, Poland.